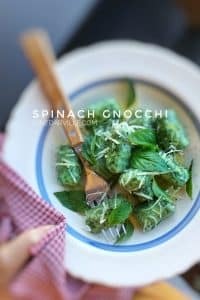 Spinach Gnocchi Recipe from Scratch | Simple. Tasty. Good. How to make gnocchi! Have you ever tried making gnocchi before? I’ve prepared gnocchi recipes a handful of times before, with various end results from heavy and floury to light and fluffy. This lovely green spinach gnocchi recipe below was just perfect: light and almighty fluffy! Making gnocchi is not an easy thing to do. If you add too much flour to the dough then your gnocchi will be very heavy and unappetising. Use the wrong type of potatoes and the gnocchi will be chewy and sticky. If you knead the gnocchi too much or you add too much flour then your gnocchi dough will be tough. Total disaster. But I found the perfect balance with this spinach gnocchi recipe! Watch my video of how I’m preparing these perfect potato spinach gnocchi in my KitchenAid Stand Mixer Mini from scratch! My KitchenAid Stand Mixer Mini is the perfect machine to make a fluffy and well combined gnocchi dough! The ration between the spinach, cooked potatoes, egg and flour is spot on. Once you have blanched the spinach, cool it immediately in an ice bath or under very cold running tap water to stop the cooking process. This will keep the spinach bright green instead of turning dark. Perfect spinach gnocchi from scratch! Add the cooked potatoes, spinach and egg to the bowl of your KitchenAid Stand Mixer Mini. Season with a pinch of pepper, salt and nutmeg. Then attach the wire whip and lower the mixer head. Select speed 4. Knead the ingredients for 2 minutes. Then turn the speed off and tilt the mixer head up. Add the flour. Lower the mixer head and select speed 4. Knead the ingredients for 5 minutes. Then turn the speed off and tilt the mixer head up again. Remove the wire whip. Remove the gnocchi dough from the stand mixer bowl, sprinkle with extra flour and knead it gently. Cut it up into small bits. Then roll the gnocchi into balls and shape them into rectangular bits between your fingers. Do this fast because the gnocchi will become too sticky and you’ll have to add more flour that will make them heavier. Bring a large pan of water to a good boil, season with salt and add the gnocchi. Once the gnocchi rise to the surface, they are tender and cooked through. Remove them using a slotted spoon and transfer them onto deep plates. Sprinkle with grated parmesan, olive oil and a dash of freshly ground black pepper. Serve hot.